In Clever Little Lies—the latest from acclaimed writer Joe DiPietro (author of Memphis, The Toxic Avenger, and I Love You, You’re Perfect, Now Change)—infidelity in a young marriage leads to family drama, some raucous laughter, and a heartfelt evening in the theater. At lights up, we meet Bill, Sr. and his son Billy who have just wrapped up a competitive game of tennis. Clearly frustrated with more than a defeat at the hands of his father, Billy (George Merrick) finally comes around to admitting that he has been having a marital affair. Seeking some advice on the situation, Merrick turns to his father, Bill Sr. (Greg Mullavey), a faithful husband for nearly four decades, for clarity and a shoulder to lean on. Mullavey and Merrick have a well-developed father/son relationship and the dialogue that starts the show is quick and witty. Not only is Merrick’s Billy having an affair with a 23-year-old gym trainer named Jasmine, but he is also convinced he is in love with her. Merrick is one year married, has a newly born baby girl, and is contemplating leaving all that behind for supposed greener pastures. Mullavey, with dialed-in comic timing, gives the fatherly advice one would expect: Do the right thing, don’t be an idiot. The conversation is left with Mullavey’s hesitant promise to keep this revelation in confidence. Bill, Sr. is right to be hesitant in making this promise because, when it comes to secrets, he knows the power that his wife has over him. Enter Marlo Thomas, veteran of the New York stage, as Alice, wife of Bill, Sr., and mother to Billy. As the scenery changes from a locker room to the house of Bill Sr. and Alice, a forced discussion on the state of the literary market—complete with dated references to 50 Shades of Grey—concludes when Thomas’ intuitive Alice senses that her husband is hiding something. She prods and questions until she gets her way, and in an effort to be a savior parent she invites her son and his wife Jane (Kate Wetherhead) to the house to investigate—er, “to have a slice of cheesecake.” Charming and with an infectious smile, Thomas is undeniably charismatic. She also has her finger on the comedic pulse of the play, and together with Mullavey the two bring the laughter in bunches. 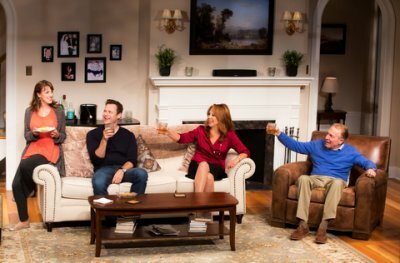 Though the comedy is prominent early on, the very real issue of adultery eventually rears its ugly head and the lighter tone of the first half of the play is nearly tossed out to make room for an emotional conclusion. Wetherhead as Billy’s wife is the last to be introduced of the quartet of actors. Her sincerity is welcome, and the big emotional payoff of the play is in large part due to her grounded performance. Before coming to the Westside Theatre, director David Saint helmed this production at the George Street Playhouse. No stranger to DiPietro’s style (he also premiered The Toxic Avenger at George Street), Saint does an excellent job of keeping the pace up when it matters most. The physical comedy is subtle and effective, but is over-the-top in just enough places to keep the laughter going continuously. Though one can hardly call the comedy of Clever Little Lies “smart”—it is more vulgar than anything—Saint employs many different tactics to elicit laughs from his audience. The set by Yoshi Tanokura is versatile, and the scene transitions are seamless: when Billy and Jane are driving to his parent’s house, the front end of a car drives itself onto center stage in front of a wall of large digital screens which project different highways and traffic jams. From behind these screens, the massive set piece which is Billy’s parents’ house rolls all the way downstage and covers the entire stage in a large open living room with multiple entrances, exits and playing spaces. Joe DiPietro’s latest is a throwback to the classic formula of the comedies that came before it. Clever Little Lies is a light-hearted romp which keeps the audience in stiches. Though there is an attempt here to deliver a meaningful message about adultery and honesty, one could also suggest that the play is a veiled attempt to condone clandestine behavior.